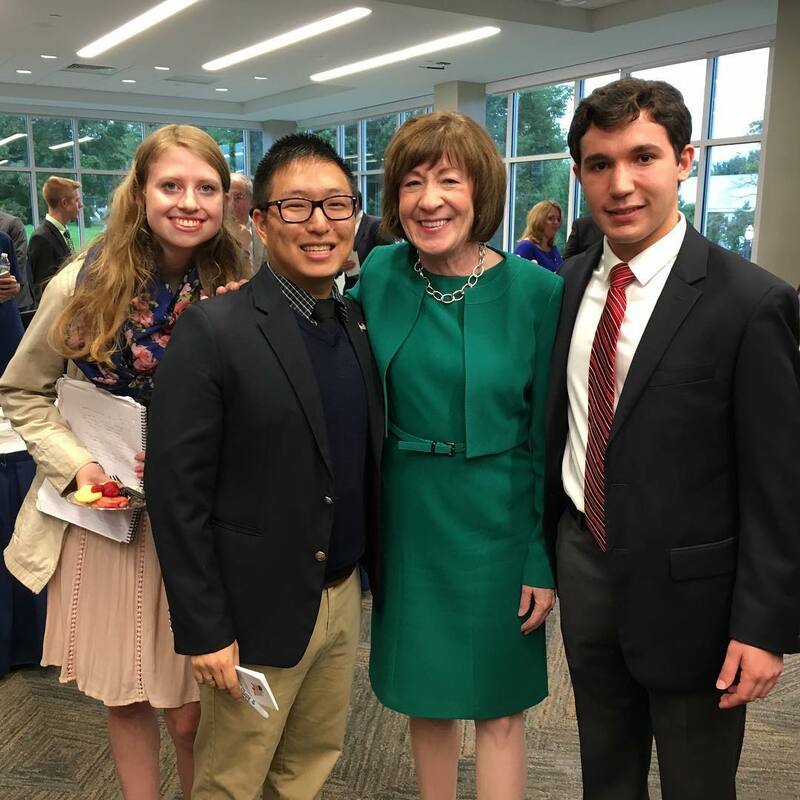 From left to right: Kati Gardella ’20, Sean Connor ’20, Senator Susan Collins, and Matthew Denaro ’21. On Sept 21, Senator Susan Collins visited Saint Anselm College’s Dana Center to discuss the topics of Civility, Cooperation, and Compromise. Senator Susan Collins is probably in the best position to discuss this topic because she has been rated the most bipartisan member of the United States Senate. This discussion was hosted by Virginia Prescott, former host of NHPR’s Word of Mouth. The questions asked by Virginia Prescott were a combination of student-submitted questions and Virginia’s improvised questions. The first question asked of Senator Susan Collins was whether the Senator was in a unique position to act in the bipartisan manner that she does, or if she did so as a form of civic duty. The senator responded by describing the way in which her parents brought her up. She explained that her parents, both having served terms as mayor of Caribeau (Maine), taught her the importance of upholding her duties at a young age through their example. It is worth noting that later in the discussion in response to an unrelated question, she admitted that she would be unable to legislate in the manner that she does had she been elected out of a deep red state such as Alabama. When asked about the current political climate, the senator responded by saying that there have been more contentious political climates, but that “the ugliness in the U.S. Senate has been unprecedented”. The senator believes special interests groups and super PACs (Political Action Committees) are to blame for the current state of calamity within the United States Senate. Senator Collins believes that more disclosure would reduce the amount of money in politics. Super PACs are by definition a type of independent political action committee which may raise unlimited sums of money from corporations, unions, and individuals but are not permitted to contribute to or coordinate directly with parties or candidates. Before Citizens United v. FEC, political contributors were required to disclose their information so that the American people knew who was influencing their political candidates. Now that disclosure is no longer necessary as a result of Citizens United v FEC, candidates are now “in the pockets” of their anonymous wealthy benefactors who provide them “shadow” campaigns. As of 2018, the average successful congressional campaign requires a million dollars. As a result of this, money is now more important to political candidates than ever. This has created a political atmosphere in which successful candidates rely more on wealthy donors than regular voters. The senator states that “we have seen a rise in ideological groups that require 100% compliance”. This is exemplified by the work done by special Interests groups. Special interest groups exert their influence in the political process by doing two things: claiming to stand for principles that their respective party should value, and using their funds to finance PACs for political advertisements, and contributions to either help or hinder a candidate’s campaign. For the purpose of giving an example look at the NRA (National Rifle Association), one of the most powerful special interest groups in the United States. Going against their interests could severely hamper the chances of election/re-election for Republican candidates because of the massive amount of influence they wield as one of the most respected and well-financed special interest groups. When national tragedies like the shooting in Stoneman Douglas High School occur, Republicans are simply hamstrung in terms of what they are able to do in terms of gun control legislation. Even if a republican wanted to enact gun control measures, they would have done so knowing that it threatened their chances of re-election. To be clear, there are liberal interest groups in the United States that hamstring democratic legislation in the same manner. Fortunately for Susan Collins, she resides in an area that allows her to operate with more flexibility than most Republicans. 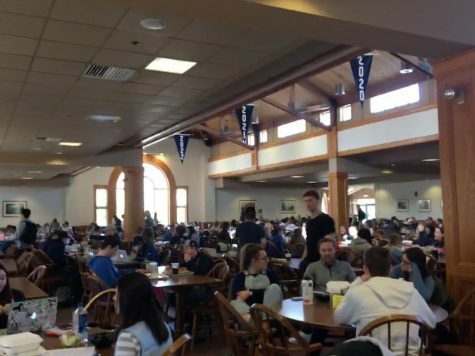 The topic of discussion later turned to current events, as multiple students submitted questions about the United States Supreme Court nomination of Brett Kavanaugh. Senator Susan Collins is currently an important swing vote that Judge Kavanaugh needs in order to be approved by the United States Senate. When asked whether or not Brett Kavanaugh would be a suitable candidate for the United States Supreme Court had he had any intentions of reversing the Roe v. Wade court decision, Senator Collins responded by stating that she asked Judge Kavanaugh if he had been asked by anybody in the White House to promise to repeal Roe v Wade; Judge Kavanaugh responded that he had not. Then she stated, “I am firmly for Roe v Wade,” to let the audience know where she stood on the issue. To conclude to the discussion, she told the audience that she believes legislation to require more disclosure will help alleviate the political contentiousness of our current era. She believes civic participation is necessary more than ever. And it is incumbent on politicians to re-establish a desire for civility, cooperation, and compromise so that they may be able to better serve the American people.